With industrial design by BMW Group DesignworksUSA, the EL-8 headphones, both open and closed-back models, is exclusive, elegant, ergonomic, flexible and portable without compromising sound quality. The EL-8 is a refined and contemporary addition that personifies modern luxury. Devoid of anything superfluous and designed for lifelong ownership, the EL-8 is as crisp as the sound it reproduces, yet as warm as the comfort it affords. The suspended headband and contoured ear pads evenly distribute pressure and weight, reducing fatigue and improving fit. The result ensures the headphone can be worn for hours in perfect comfort and relaxation, thus meeting the exacting standards of audio professionals and audiophiles alike. With fine wood accents and exceptional build quality the lightweight EL-8 features the world’s most advanced planar magnetic technology available today, with sound quality unheard of in this or any other price category. The EL-8 features revolutionary Fluxor™ magnetic technology and a Uniforce™ diaphragm material that was originally developed by NASA for lightweight electronics to withstand the rigors of space. 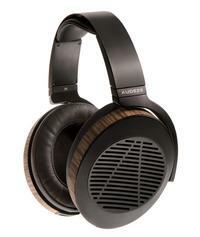 Audeze reengineered this super strong material to work as a planar magnetic driver. The Audeze EL-8 combines new magnetics science and space-age materials to deliver a stunning you-are-there sound experience. Audeze EL-8 headphones let you fall in love with your music all over again. The same feeling you had when you went to your first concert. When you played your first album. Your perfect music connection. The closed-back EL-8 offers all the benefits of the open-back EL-8 — flexible, lightweight and loaded with new technology — while isolating the listener and reducing ambient noise as no sound escapes the earcups. The EL-8 closed-back is also sensitive enough to be driven directly by portable players and smartphones, but an external amplifier produces better results. They're built with superb craftsmanship, wood veneer accents and enormous attention to detail.